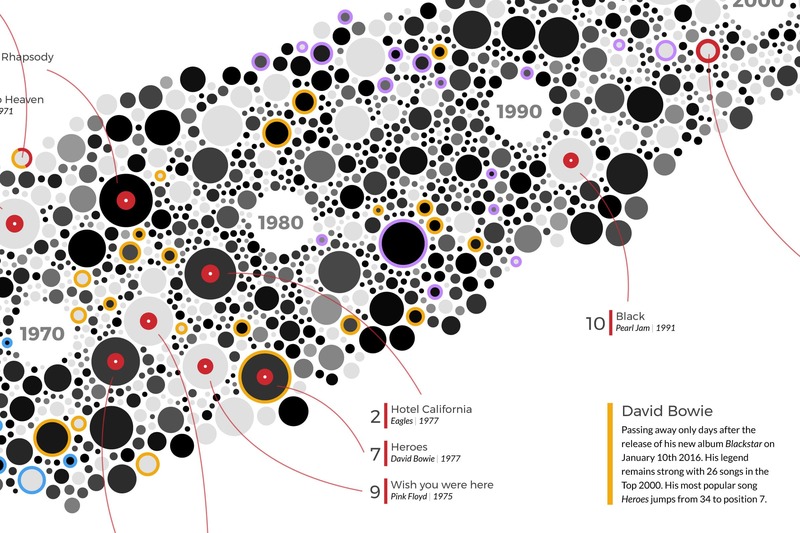 This infographic looks at the Top 2000 songs ever made and how they are spread according to their year of release. From the 60’s in the bottom left corner to 2016 in the top right, each song is represented by a circle. The circles are sized according to their position in the Top 2000 and the darker a circle, the higher the position it reached in the weekly top 40s. Several groups of special songs are highlighted. Such as all 38 tracks from the Beatles in blue, David Bowie in yellow and Prince in purple, while the top 10 is made even more apparent by making them appear as tiny vinyl records. 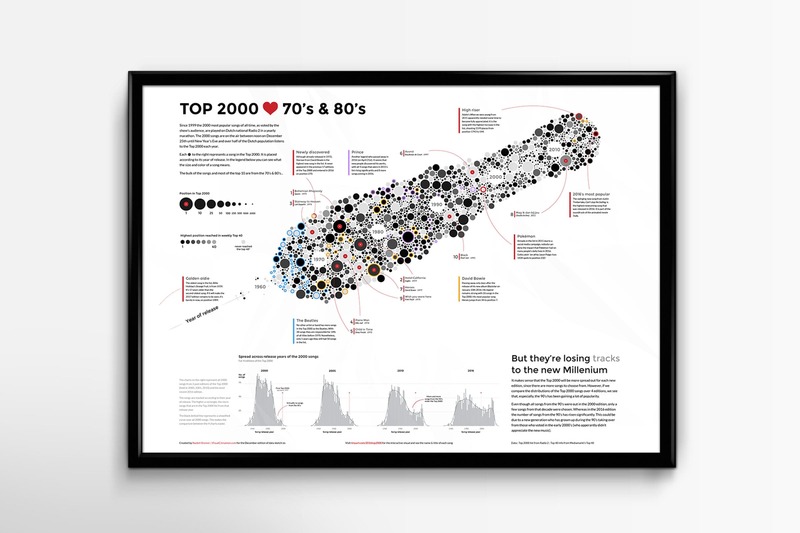 The infographic shows that the 70s & 80s are still the most appreciated era’s in terms of music. When you’re saying music in December to somebody from the Netherlands, there’s a very likely chance that they’ll think of the Top 2000. A yearly chosen list of songs which is played between Christmas and New Year’s. My basic dataset was the Top 2000 list, which had the artist, title, position in the Top 2000 and year of release. I also scraped the weekly Top 40 website and matched these to the Top 2000 titles to get the highest position each song reached in the Top 40. 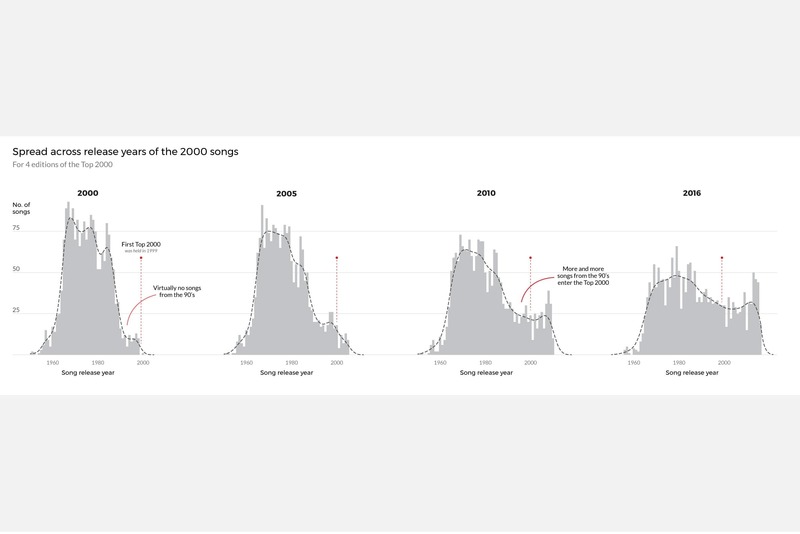 For the poster I looked at the spread of the Top 2000 in 3 earlier editions to visualize how the most popular decade is slowly shifting to newer decades. I turned this into 4 histograms in R which I imported into Illustrator to clean up and combine them with the beeswarm style visualization at the top. 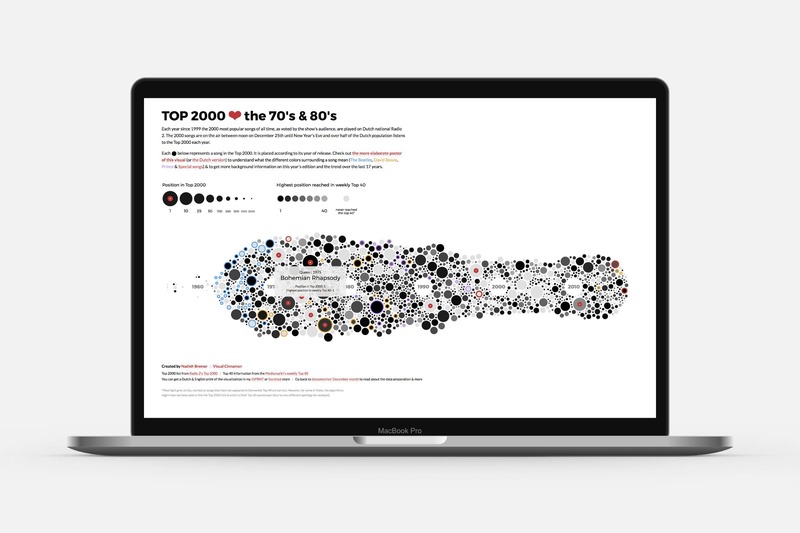 Besides the static poster version, I also made a (simple) interactive version in which all of the 2000 songs can be investigated. You can read more about the data, design & coding on the data sketches’ December write-up.